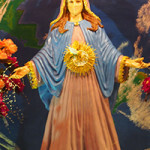 Mother Mary appeared in very bright light at the ‘grotto’ at the house of the Visionary, in the 2nd Glorious Mystery, in the 3rd Hail Mary and the apparition took 10min. Mother Mary came with a marvelous Angel to support us. Receive a blessing that comes from all My heart. Love My Son Jesus with all your soul. I am your Mother who guides you on the good path. Pray and don’t go backwards. Live well with one another and love each other. Never be afraid of anything. Don’t do things in a hurry without thinking, because My Son Jesus knows when you will finish all your tasks. Give strength to those who feel ill. Don’t lose faith and trust in the Holy Spirit, in Me and in My Son Jesus, that we will help you to be relieved from your pains. My children be humble and go slowly through life, because life isn’t easy any longer and many of you go through hard times. There are days that you don’t have food in your homes. When you fall you must stand up again and keep going. Be patient for what you still have not received in your life, it is on its way. I know that you cry and that you hurt. Don’t lose your patience, your dreams will slowly become reality. You always must speak well to each other, because many of you suffer of hurt hearts. My Son Jesus gives love and He is merciful. Whenever you are in pain you must go to the Holy Sacrament and kneel so you can receive strength to keep on pushing forward in your family. This is the year to unite within families so that there can be love, tranquility and peace, because you don’t know how much time you have you left to live on this world. Give value to one another as you are alive. Give each other tenderness from the bottom of your heart. Never make each other cry and hurt each other. If you are spiritual, you will never be able to do that. My children don’t skip praying the Holy Rosary. Pray it every day, that gives strength within the family. Stay in the light and move away from the darkness, because evil will always come to attack you, especially those who can’t imagine this and who are not prepared for what is coming. It is for this that you have pray each day and bless each other. Give love and don’t despise each other. Thank every day for your life, thank for all that you receive no matter how big or small it is. My children, if you encounter people who can’t pray, teach them how to pray with joy and with a smile. Don’t be afraid, but keep at it, because you can all succeed. Your Mother, the Virgin of Grace of Aruba, who loves you forever.